In this 4 part series I want to share with you how it came to be that Love and Humanitarian Clowning became my life’s purpose. 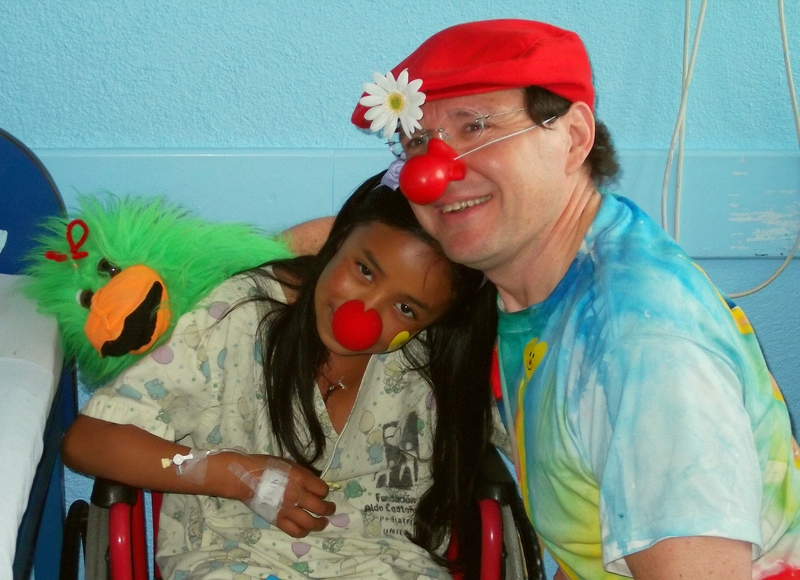 Part 1 covers the transition period that lead me to leave for Guatemala with Patch Adams. I will conclude this 4 part series with my Oath to you, wishing to inspire more love and growth for all Humanity. For the last few weeks I had borrowed books on the fear of flying at the library. As I read I felt more and more prepared for my journey. The day of departure finally arrived! I dressed up as a clown and made my first public appearance at the airport. Remember that so far my aim in life was to be invisible. I was daring to change, believing in what I was doing. I had a 2 hour connection in Atlanta coming up, which slowly melted away as the attendants kept announcing delays for our departure. So much for keeping calm. As we finally boarded, 2 hours later, I raised many eyebrows as I walked down the aisle : ”Who’s this clown?” they must have been thinking, literally! It was a small airplane, one passenger to my right, the aisle to my left, and two more seats on the other side. I got my Fear of flying book out, my photos and my letters ready, and tried to relax as my neighbor totally ignored me. I listened to some relaxation music I had prepared, and practiced my slow rhythmic breathing exercises. As we lifted off I reviewed the science of aerodynamics. I felt calm; all in all I’d say it went very well. The flight attendant enjoyed my smile and costume, and as we chatted away she offered me double drinks and snacks. I was on my way! I met a warm and wonderful father and son Payasito Chisguetin and Chisguetio in the streets of Guatemala. Across the aisle was this very talkative young man who would later become a life saver: Hugo. He left Guatemala 15 years ago to live in Montréal. He was going back to visit his relatives. Very friendly, we had an enjoyable talk. He was worried about making our connection. When we did finally land we literally had only a few minutes to catch our second flight! We were separated as I had to wait for my on board luggage, I then started to look for my departure gate. I was at gate 4 and had to go to 24, not too bad I thought. So I started to walk, then jog, then run like crazy as the distance between the gates were humongous! Atlanta airport was immense! Now call me crazy or not, you have to imagine a clown running in the airport! Remember those nice extra drinks the attendant gave me? Well, I didn’t go to the bathroom in the airplane, so I did the unthinkable! (No, I didn’t pee in my pants… ) I stopped at the washroom and relieved myself! Having a mixture of relief and dread, I then stepped up my run to finally see a flight attendant desperately waving her arms towards me. I sprinted the last 50 meters, my on board luggage barely touching the ground. We both let out a big sigh of relief as she finally closed the door. Pfew, made it! The second flight was better than the first, my stress was gone. I was in my seat and I could now relax. Hours later as I walked off the plane the heat and humidity hit me! I had just left snowy Montréal in one of its coldest winter in decades. I met up with Hugo at the carousel where we expected to pick-up our luggage (which of course with our 10 minutes layover in Atlanta was unthinkable) He explained our situation to the baggage handlers and got our missing tickets filled up. Hugo then generously offered to help me find my awaiting driver in the lobby. Without a word of Spanish all of this would have been a nightmare! Finally I saw someone holding up a sign with my name on it. I gave my new friend my first official clown hug, and off I went in the middle of the night in the streets of Guatemala City. I had done it! After an half an hour ride the driver stopped in front of an old dusty facade. Stepping out, he reached is hand through the iron grid covering the front door and rang the doorbell. The windows also had bars on them. The door opened: Francesco welcomed us with a big smile and gave me the keys to my room. Exhausted, with no change of clothes, I gratefully accepted and proceeded to make myself at home. I was looking forward to meeting my new Facebook friend, Clown Rob, with whom I had chatted since a couple of weeks prior. That would have to wait though; now was the time to sleep. I woke up in the morning with the sounds of chatter. The staff was sweeping the inside court, and the cling clang of dishes made me sense that they were setting up for breakfast. I cleaned myself up, a quick shave, had a drink of water from the pitcher they had kindly prepared and opened the door. I first met Francesca, the owner, who made us feel like our mom, welcoming her sons and daughters, and there, at the breakfast table, sat Rob. He looked me in the eyes, took me in his arms and gave me a big hug. 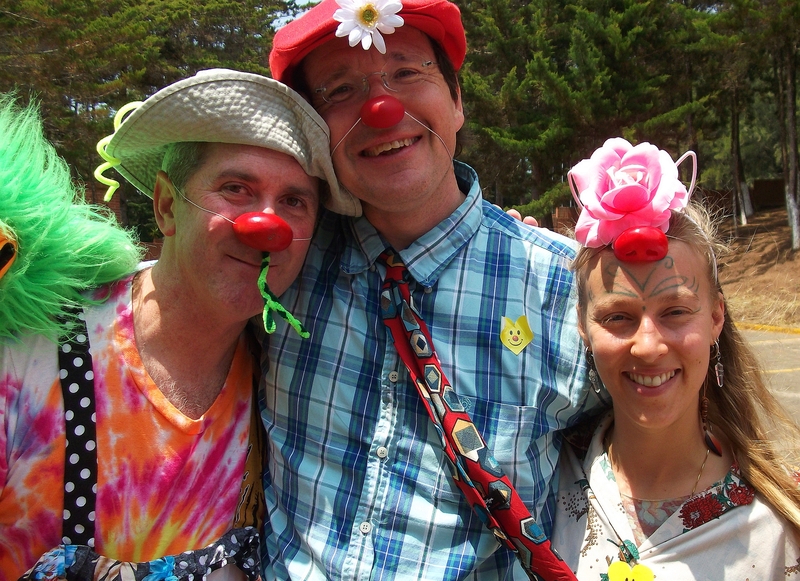 I was discovering the spirit of Humanitarian Clowning: hugging with love and purpose. There are so many many more stories to tell: how I first met Emily, Chappo and Pamela, Carmen, Dee Dee, Christy, Margaret and her sister Lori, Jerry, Judy, Sara, and on an on. They were my new sisters and brothers of my Clown Family. But this would make for a 20 page part 3 post, so I’ll have to save those for later. 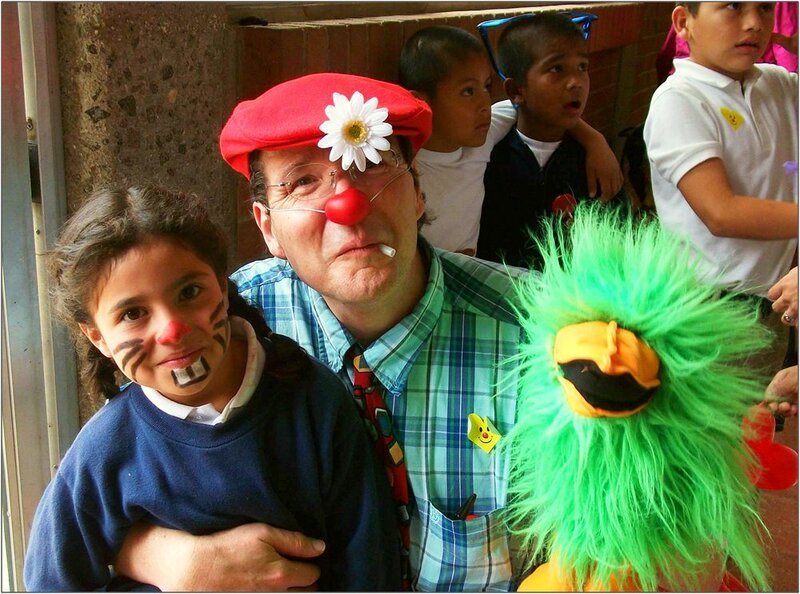 International Clowns unites with the Guatemala Clowns of Fabrica de Sonrisas! Needless to say I had never been in such a community of loving and happy people. We came together as a group by the amazing Ash, and the soft-spoken Pedro. Their devotion to bringing us here, making sure that everyone was well taken care of and listened to, was nourishing. I learned with them that we are giving care and love, and we need each other, and that we were always there for each other. 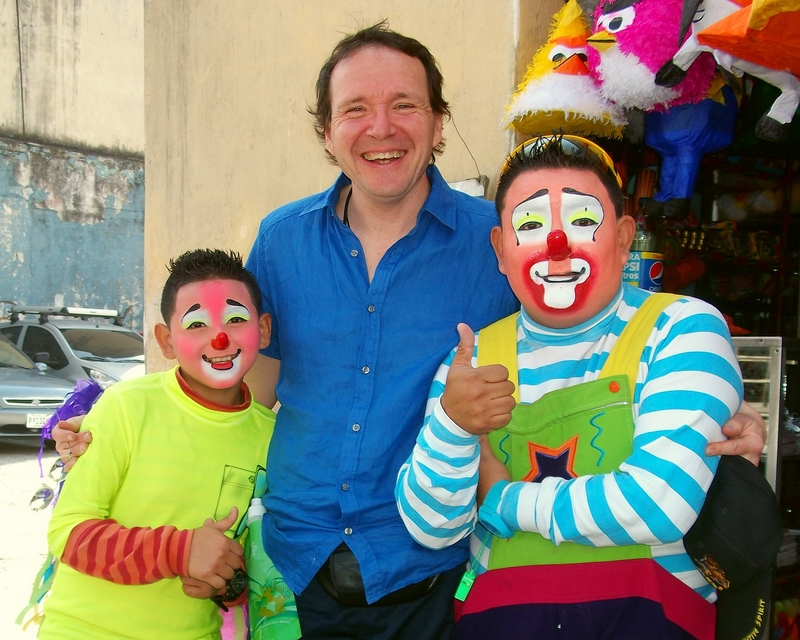 Later I would meet the amazing Clowns of Fabrica de Sonrisas. These hearts giving teams of Clown Doctors would welcome us like cousins when we arrived at the hospitals and the orphanages. They could help us translate if need be and we went together to cheer the children,patients and staff alike. I love them. Patch is as big as his heart and devotions are! And that is an understatement as he stands nearly 2 meters tall. He cares for everyone, he cares for his mission, and is passionate in seeing through his dream: building the Gesundheit Institute. For this he has been travelling the world care clowning and relentlessly giving lectures. He was welcoming us in his vision of world love: ‘The Love Revolution” as he calls it. Christy, Patch and I are doing the typical Patch nose greeting! He was born in May 1945, and I in November 1959. I always felt I was born a few years too late, just after the Hippie and Flower Power era. I never felt I belonged in our modern society, and in Humanitarian Clowning I suddenly found a community where I could belong. 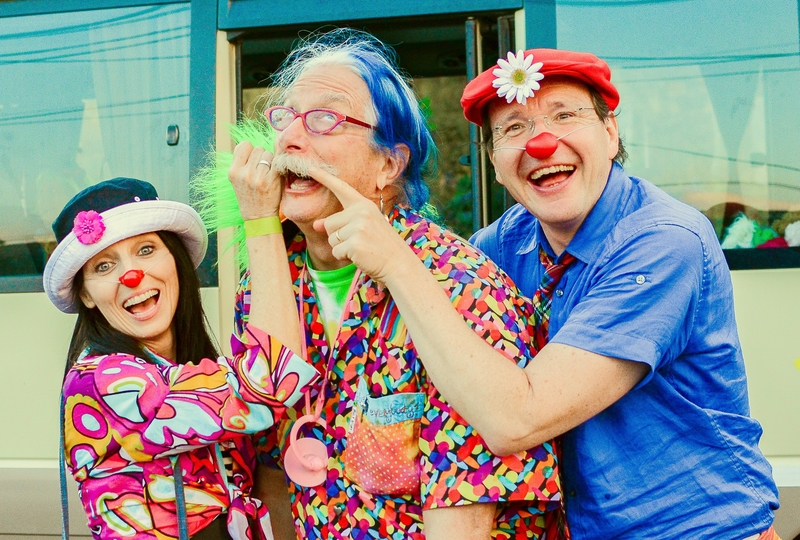 A year ago I started my journey with the world of laughter yoga and it lead me to where I am today: Care Clowning! Each step of the way I had to go beyond my comfort zone. I had to leave my fears behind. Each time I dared close a door, dozens of new energetic loving inspirational people appeared on my path. As the saying goes: ”When the student is ready the teacher will appear”. Each day as I was clowning with my new family I felt I was living more of my life. Remember the 5% to 95% ratio I wrote about in part 1 of this series? In Guatemala this totally shifted: I was now living and giving my best 95% of the time. I had achieved beyond my wildest dreams what I had hoped for! But for this to happen I had to learn my biggest lesson: being vulnerable. I already described in my previous post 9 – Life is an adventure how anxious I was at my first clowning experience, and how Emily was there to help me welcome and reconnect with myself. As the days and visits progressed, I found more support from Rob, Dee Dee, Nilo, Ash and the others. Being with the kids gave me the opportunity to give more and more of myself, each day opening up my love like the petals of a blossoming flower. And then on a Wednesday morning I met Yorbely. She changed my life! Yorbely is a 8 year old child in the Valley of the Angels Orphanage. There I met Daniel and dozens of other young children, all smiling and full of joy. They welcomed us with a big ceremonial song, we were all moved by their kindness. Somehow Yorbely connected with me as soon as we started clowning, and she stayed by my side most of the time, playing Patty Cake Patty Cake, giving away stickers, dancing, running and just being silly with my puppet Jackô. Noon came and we had to break for lunch. Yorbely didn’t want me to go, so I took her in my arms and walked around with her a bit. I told her we’d be back right after lunch so we would catch up again later. I let her go, she had a glowing smile on her face, and that’s when it happened! As she walked away, I was overcome by sadness and a big lump in my throat. Teary eyed I though that this young wonderful happy spunky child was an orphan here, and that there was nothing I could do about it. I could go back home, with friends and family, but she was just going to stay here. It made me so sad, but what could I do? Nothing! I saw and accepted my powerlessness and vulnerability. I felt I could give her something, me, fully and wholly; be available for her, while giving her humor and pleasure at the same time. At that moment I became a Care Clown! Coming back that evening I discussed my thoughts with my friends. Rob talked about compassion, for her, and for me. That night I cried in my bed as I finally gave myself these two feelings: compassion and vulnerability. I never had the space for them before. This was new for me. The next evening after supper I opened my heart and shared my life’s story with everyone, as I never had done before. They looked at me thankfully for my vulnerability, they hugged me; I was home. Back in my room, alone, I cried some more as my stay in Guatemala was coming to an end. Crying for leaving behind my new found friends and family. Crying from having just discovered a new kind of love I didn’t know about, something I would come to know later as a Brotherhood. As Rob said: ”Guy, you’re my brother now”. Rob and Emily, two of the amazing clowns that forever changed my life. In part 4 I’ll tell you what happened when I came back home, joined the AATH Conference, the birth of Citizen Clown. 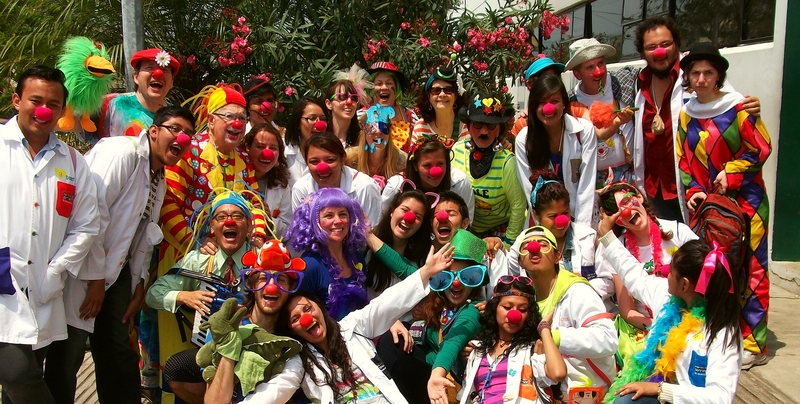 my upcoming Care Clowning trip to Tamil Nadu, India, and so much more! See you there!